Cold sores, sometimes also known as fever blisters, are small red sores which develop outside of the mouth. 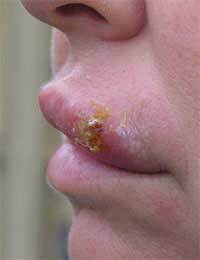 These sores are most often found on the outer lips, chin, cheeks or even in or around the nostrils. Cold sores are contagious because they are caused by the herpes simplex virus type 1, so knowing the symptoms of cold sores and how to treat them is important to limit the possibility of other people catching cold sores from you. Cold sores are "caught" when someone is infected with the herpes simplex virus type 1. Such an infection can result from contact with someone who has an active lesion, or contact with an object which has been in contact with an active lesion. This means that touching a cold sore, such as through kissing, or using the same (uncleaned) utensils, razor, cups or glasses, napkins, tissues or towels could result in an infection. Sharing lip ointments, cosmetics or even cold sore creams which have touched an active lesion could also result in an infection. Once an infection has taken hold (called the primary infection) the herpes virus will lay dormant in a person's nerve cells within the skin for the rest of his or her life. This means that an active infection can break out in the future, particularly if the person is under stress, becomes overtired, is at a particular time in her menstrual cycle, experiences a fever or even is exposed to the sun. Cold sores present a variety of symptoms both during the primary infection and during active infections later. Symptoms of a primary infection may include blisters or sores outside of the mouth on the lips, cheek, chin or nose, bad breath, swollen and/or tender gums, sore throat, swollen glands, headache and fever. Symptoms of active infections after the primary infection often include a tingling sensation at the site of a new sore or blister, redness and swelling prior to the development of the sore or blister, the sore or blister itself, popping of the sore or blister and the development of a scab. Such a scab tends to be present for a week to 10 days. Sores or blisters tend to develop in the same places for each individual who suffers from them. There is no cure for the herpes simplex virus type 1 but there are medical options for treating cold sores. A GP may prescribe anti-viral medication for particularly severe or frequent outbreaks but most cold sores can be effectively treated with over the counter medication. A painkiller such as paracetamol is usually enough to ease any associated discomfort while anti-viral cold sore creams will treat the sore or blister directly. A variety of anti-itch ointments are also available over the counter which may help reduce irritations associated with cold sores. Ask your local pharmacist for advice when selecting over the counter medications to treat a cold sore. There are also a variety of home remedies for treating cold sores. Some people swear that holding ice or a warm tea bag to a cold sore will help alleviate the discomfort of sores or blisters. Others believe that rubbing witch hazel or aloe vera onto a sore or blister provides similar relief. Still others feel that because the herpes simplex virus type 1 is a life-long infection that changing one's diet can help provide relief from cold sores, especially avoiding acidic and salty foods and increasing the intake of fruits, vegetables, zinc and iron. Chewing on real liquorice may also help halt a cold sore outbreak. Limiting secondary infections is also important for those suffering from cold sores, so covering an open sore with petroleum jelly, changing toothbrushes following an outbreak, avoiding touching an open sore, avoiding picking at a sore's scab and thoroughly washing hands after touching and/or putting medicine on a sore remain important as well. When cold sores do occur they can be embarrassing due to their very public appearance. Dabbing a small amount of petroleum jelly onto a sore will help "seal" it, and then a touch of cosmetic cover-up can be applied on top of the seal to help disguise the sore. Cold sore "patches" are also now available and can be applied to cold sores both to treat them and hide them. These patches are clear so they virtually disappear when applied. Cold sores are ugly and infectious, so knowing what causes them, common symptoms, how to treat them and how to hide them are important. With this information you can help your own cold sores disappear more quickly as well as limit the possibility of spreading an infection to someone else.